I think this course is great for programmer with no electrical engineering background. After taking this course, now when I do coding, I can imagine the background process done by the laptop -- logic gates, ALU, RAM, BUSES, machine language and the assembly language. I did not do the assignment of this course, as it needs to install a software that chrome thinks that it is harmful. This course require no hardware to start, it uses a software program to simulate and to write a logic gate. From the logic gates we build a 16 bits pc. Nowadays, we are building a computer from a computer. 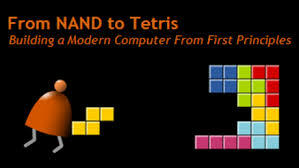 There are no part 2 yet, the book "From Nand to Tetris" should contain from assembly to tetris part.